At GUTS Training Center, we often talk with our young athletes and ball players about “fear". In the realm of sports, fear is one human emotion that is not compatible with optimal performance; fear leads to paralysis, which is the death knell on the field of play. The athletes that overcome their fear (or demonstrate fearlessness) are the ones that excel in competition. It's only natural to have fear, and this is what we communicate to our athletes. However, we work with them to face their fear which is the first step in overcoming it. Fear. Fear is nothing more than a lingering emotion that’s fueled by your imagination. Danger is real. It’s the uncomfortable rush of adrenaline you get when you almost step in front of a bus. Fear is a choice. Successful people know this better than anyone does, so they flip fear on its head. They are addicted to the euphoric feeling they get from conquering their fears. Don’t ever hold back in life just because you feel scared. I often hear people say, “What’s the worst thing that can happen to you? Will it kill you?” Yet, death isn’t the worst thing that can happen to you… The worst thing that can happen to you is allowing yourself to die inside while you’re still alive. For the young, aspiring athletes under our tutelage, we will continue to discuss fear and we will keep pushing these kids to face their fears head on. Most importantly, we’ll continue to impart to them that they are not alone in their struggle to overcome — we are in this struggle together. I hear about quick weight loss programs all the time and sometimes they come with guarantees or you can get your money back. I call these quick-loss programs “fad diets”; quick weight loss through an unhealthy, unbalanced and unsustainable diet. Fad diets are targeted at people who are desperate to lose weight quickly without exercise. A 2-year study by Stuart Wolpert of the UCLA Researchers Report showed that 83% of people on these quick weight loss programs gained back more weight than they originally lost while dieting. Meaning, if you start at 140 pounds and dropped down to 125 pounds, you not only gain back the 15 pounds you lost but you add weight beyond that. Consequently, instead of losing weight fast and keeping it off, you are destined to gain more weight over the long term. In my book, “diet” is a four-letter word. I’ve never liked the word “diet”. Rather, I promote a “lifestyle” to my clients, not a diet. Losing weight quickly is not going to be a long term solution to keeping weight off, and it can be very unhealthy. It also has psychological consequences with many folks simply giving up. This is no way to live life. The hardest thing for most people is being patient. You didn't put all the weight you are carrying on in one day, one week or even one month. It was a slow process. So it’s stands to reason that losing weight should follow a similar timeline. If you want to lose weight and keep it off, let’s start with a discussion. We will address your diet in practical terms. We also promote the benefits of weight training to help in the process of losing weight and creating a better quality of life. At GUTS Training Center, we not only work on helping you reach your goals, but we teach you how to do it. I know my friend well. No need for me to venture a guess. When I was growing up playing sports, I had to “earn” a trophy. Whether playing football, basketball or baseball, this meant that my team had to be better than all the other teams on the field of play. The team with the best record at the end of the season walked away with the trophy. Furthermore, my playing time was “earned” and not guaranteed. The best players played the most. This was true even when I played tee ball (we played competitive tee ball up until the age of 8 years old). When I was in grade school, the 7th and 8th grade combined to make one baseball squad. There was only so many jerseys. When the final roster was read aloud, my name was not on the list. I was devastated. I had never been cut from a team in my life. I remember sitting by myself with tears in my eyes, waiting to see my dad’s car pull up. When he arrived, he took me to my favorite restaurant. Over dinner, he let me vent my frustration. I told him how much better I was than many of the boys that made it over me. I was better, right? To his credit, my dad mostly listened. He didn’t admonish the coach or acquiesce that I got short changed. Rather, he helped me deal with disappointment. He helped me deal with failure. He let me cope with the situation. Developing coping skills at an early age is indispensable in dealing with life’s many challenges. However, when “everyone is guaranteed a trophy,” we as parents are not allowing adolescents the opportunity to develop these necessary skills. I have been coaching and instructing young, aspiring athletes for much of my life. In that time, I’ve witnessed way too much coddling and not enough tough love. As a result, I see these kids develop an attitude of entitlement. Kids whine and cry when they do not play enough or when things don’t go well for them. I have no patience for this type of behavior. I don’t blame the kids, I blame the “trophy givers” — the parents. Over the years, I’ve had parents take me aside and question why their child is not playing more, or playing a particular position more, or batting higher in the line up, or maybe I’m a little too hard on their little pride and joy. Many times, these parents tell me how much better their child is than so-and-so’s child. To their chagrin, these parents find out quickly that this does not change the situation. Bottom line, each player earns their playing time. Typically, these parents leave the program for greener pastures because, as we all know, the grass is ALWAYS greener on the other side of the fence. For the record, I coach a team that has one of my sons on the roster. Over the past two years, my son has played the least amount of innings, has had the least amount of at-bats, of any player on the roster. Yes, he has to earn his playing time. Importantly, I ask him if he enjoys playing baseball and he always tells me, “Dad, I love it!” He’s getting all the development and training and he’s working towards a goal of making the high school team. As a father, I’m very proud of him. He’s handling his situation very well. Not everyone makes the team. Not every student is valedictorian. Not everyone gets accepted to their first choice of colleges. Not every applicant gets the job offer. Not everyone gets the coveted corner office. Let your child deal with a little adversity. They’ll be better for it. If you are like me, you thought (or perhaps hoped) that healthcare legislation would rein in escalating healthcare costs over a reasonable period of time. In reality, individuals and families are spending more and more each year on healthcare and the outlook is not promising. According to the Kaiser Family Foundation, a non-profit organization focusing on national health issues, as well as the U.S. role in global health policy, the average family’s health insurance now costs about $16,000, and workers pay more than a quarter of that. 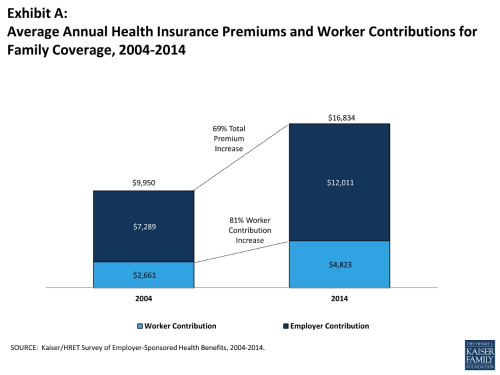 From 2004 to 2014, total premiums have increased 69% and, for those that have a job, worker contribution increased 81%. The current situation is disheartening but, not to fret, I have the answer! If you take care of yourself — exercise regularly and eat right — you can avoid burdensome healthcare costs in your future. If you heed my sage advice, I could save you thousands of dollars (if not hundreds of thousands) over your lifetime. You’re welcome! Now, I’m no Pollyanna. I know how difficult it can be to eat right and exercise regularly (I’m saying this as I shove the last piece of meat lovers pizza down my throat). Furthermore, many families are struggling financially and eating right and exercising can be tough on the family budget (you can feed a family of four at McDonalds for $10!). Even so, many families do have the discretionary income to put towards their and their family’s health and well-being. So, consider the value of a personal trainer, especially long-term. Do the math. Yes, you'll be healthier and happier but it also makes economic sense. Forget about the boilerplate catchphrase, it is a great investment in yourself. I say, it’s simply a great investment. Throughout our years of coaching and instruction, we have heard from parents that they are sending their son or daughter to a particular instructor who has quite a resume; some pitching in college and some at the professional level. Personally, I believe that practical experience does make a difference. However, we always ask if the instructor is videotaping their child. If the answer is "no" then it really doesn't matter how high up the ladder the instructor climbed in their career. You are not getting your monies worth. The human eye simply cannot isolate all the nuances of the complex pitching delivery, arguably the most difficult motor skill in all of sports. Consequently, videotaping is necessary for an instructor to properly diagnose mechanical flaws. Furthermore, visual feedback is necessary to effectively convey the diagnosis and prescribed remedy to the athlete. Below, I've excerpted a segment from www.pitching.com (November 24, 2014) that supports our claim. Coull, J., Tremblay, L., & Elliott, D. (2001). Examining the specificity of practice hypothesis: Is learning modality specific? Research Quarterly for Exercise and Sport, 72, 345-354. The specific of practice hypothesis was examined using a tracking task. College students (M = 12; F = 28) were Ss and presumed to be novices at the specific task. Two experiments were conducted. First, visual and auditory feedback about performance was provided. Vision was deemed more useful than hearing in the early stage of acquisition. Performance gains were retained when no feedback was provided. Learning was specific only in the visual learning condition. Second, visual feedback and auditory feedback were combined. Similar results to the first experiment were revealed. Vision appears to dominate audition in the learning of motor tasks. Implication. When learning a task, visual cues should be emphasized to produce better instruction. Sign up with your email address to receive news and updates from GUTS™! Thank you for subscribing to GUTS™, stay tuned for news and updates.